Fortnite Battle Royale Major Map Update Details | Nerd Much? The possibilities in Battle Royale are endless. Fortnite Battle Royale is getting a major map update this Thursday. The new map will include a city (Tilted Towers), underground mines (Shifty Shafts), and a car junkyard (Junk Junction). Tilted Towers is a small city set in a mountainous area filled with plenty of sheer rock faces and tall pine trees. The city itself has what all cities have in common, streets, cars, short and tall building, and even a church or two. Well, pictured in the video is at least a bell tower with a clock face on each side, it is not necessarily a church bell tower. 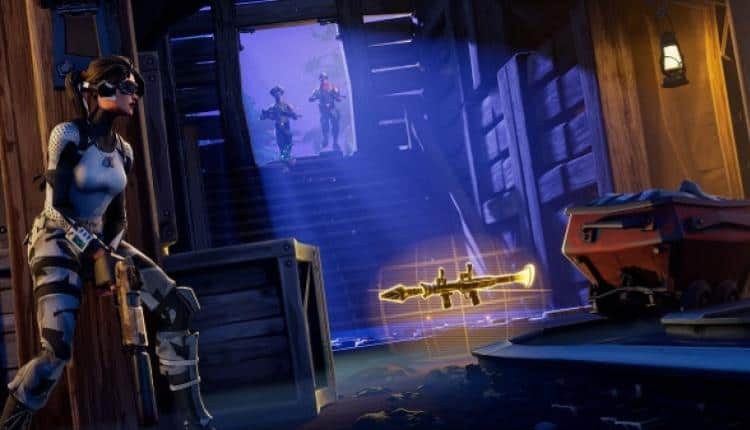 Shifty Shafts could be called the set of Firewatch, set in the deep wilderness. There are small buildings scattered throughout the area, most covering mine shafts, others are living shelters or processing factories. Within the mines are mine carts on long winding tracks. In the video, two players have taken it upon themselves to build a small fire near the entrance. Hopefully, these mines are not filled with coal, or a fire would be a major problem. Junk Junction, also named The Boneyard, is a boxed-in area where recycled cars are carefully stacked. There are two attached buildings here, one is a two-door garage and the other is likely a retail service building of some kind. A third building lies within the enclosure as well. Next to this building is a truck moving a few recycled cars. On a hill behind the junkyard is a large llama made of steel. As usual, the possibilities in Battle Royale are endless and Epic Games is working hard to open up even more. What do you think of this new map? Is the diverse landscape going to make the game more fun and challenging? Let us know your thoughts in the comments below.